On Friday, as I lowered the back door of the aircraft, turned and reversed down the steps onto the tarmac, I felt cool dry April afternoon air swirl around me and lift my spirits. I had come home. Home to Southern mountains, to prospects of winter frost, to Trout, and good coffee. I had left behind sticky Mozambique, with it’s potholes, humidity, train ambushes and sugarcane. I had left behind Tanzania’s red earth rivers, it’s bribes and mosquitoes. I had left behind Lusaka’s dust, incomplete buildings, and broken machinery. We had retreated to the place with good freeways, neatly laid out farms and towns, and familiar faces. Returning home made me contemplate the uniqueness of this Southern tip of the continent. For a week we had emersed ourselves in flat humid places. Places with rolling hills at most. Lush places of brilliant green foliage against a lot of bare red earth. A LOT of bare earth! We had flown over them, conversed with their people, and experienced the vastness of what lies to the North of us. Something more vast than the whole of the USA in a sense: where you can fly for an hour and find yourself two days drive from where you were, and listening to a completely new set of languages in a place ruled and governed completely differently from where you had breakfast. A great big dusty, muddy, overgrazed and degraded landscape. Heavily populated in the sense that the populations of Africa spew across the land like something spilled there. Their occupation hap-hazard, devoid of planning, and the impact on the environment always evident. Back home, the pollution is piped below the surface, the people live in neat rows, and the bugs get nuked with frost in winter. There are more higher plateaus where one can escape thorn trees and tropical looking bush. Trout plateaus. Something that does not exist at all across Namibia, Zambia, Malawi, Tanzania and Mozambique….. the places we were returning from. 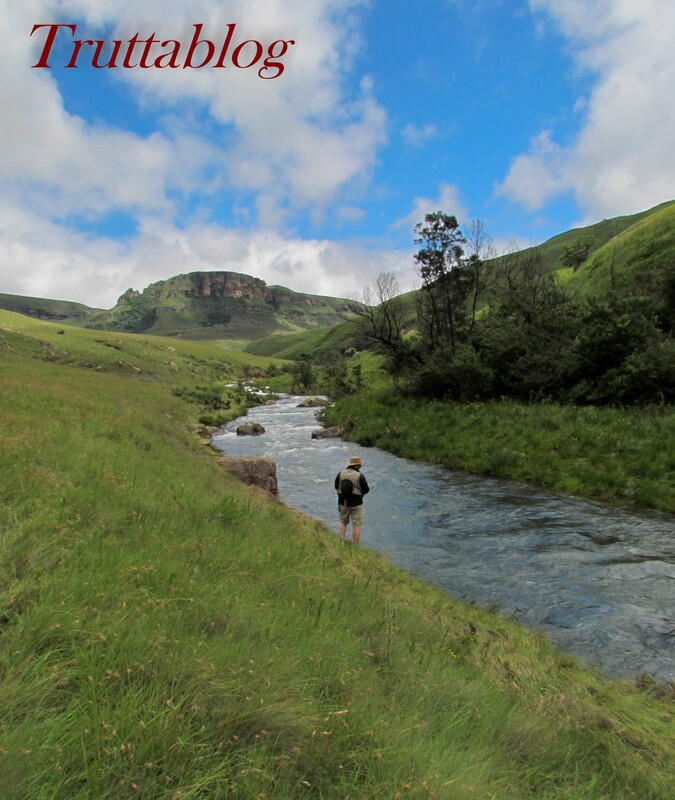 A week or two earlier I had struggled to convey these differences to two Canadian travellers who are planning a fly fishing trip overland from Tanzania to the Western Cape. In my own mind it was fairly clear. They would see bush and big rivers with Bream and Tigers (which I know so little about) for thousands of miles through indigenised Africa, and then they would emerge down here needing less money for bribes, a small stream stick, a couple of dry flies and some warmer clothing! I get a sense that we really do live in a cocoon down here. One that is under threat of being burst by things like global warming, the banning of Trout, and the rise of corruption. I need to get my feet in a cold Trout stream soon to re-visit some of my sweeping statements above, and to give this all some more thought. This entry was posted on April 6, 2014 by trutta. It was filed under Streams, Trout breeding & stocking and was tagged with Mozambique, South Africa, Tanzania, Trout in Africa, Zambia. So true Andrew, nice piece – thank you. Thanks Peter. My objection to the draft NEMBA regulations trying to eradicate Trout from South Africa are being drafted now, and will be in before tomorrow’s 4 pm deadline. I hope that all out Fly fishing colleagues will do likewise, and that we can play a part in saving this precious resource that we so love. Indeed Andrew. I have pushed a number of avenues and some have indicated that they have submitted objections, but many haven’t. They will be the ones to scream the loudest if their sport is affected in the future! I have also had good submissions from Roger Baert and Maitland Knott as well as others from overseas. We who live in beautiful trout terrain must certainly feel islanded, protected for the most part from those threats you mentioned, but vulnerable to them as well. We stay in contact with our beloved lands and waters and feel there must be something we can do.